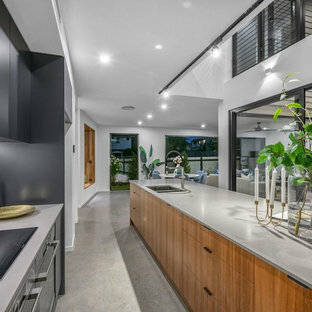 Design ideas for a contemporary l-shaped open plan kitchen in Sunshine Coast with black appliances, an island, a double-bowl sink, flat-panel cabinets, medium wood cabinets, window splashback and grey benchtop. Design ideas for a contemporary galley kitchen in Brisbane with an undermount sink, flat-panel cabinets, medium wood cabinets, grey splashback, concrete floors, an island, grey floor and grey benchtop. 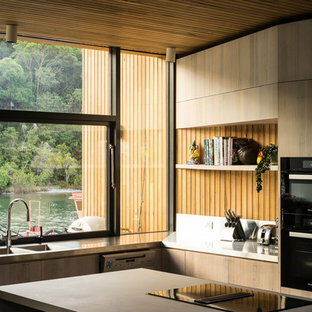 Photo of a tropical u-shaped kitchen in Sunshine Coast with an undermount sink, flat-panel cabinets, medium wood cabinets, window splashback, panelled appliances, a peninsula and beige floor. Design ideas for a modern galley open plan kitchen in Sydney with flat-panel cabinets, medium wood cabinets, window splashback, stainless steel appliances, an island and grey floor. 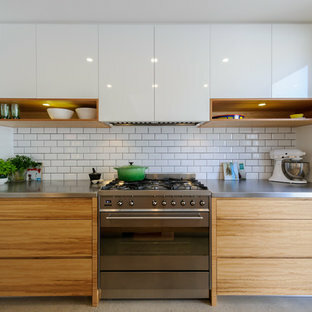 Photo of a contemporary galley open plan kitchen in Melbourne with flat-panel cabinets, medium wood cabinets, window splashback, concrete floors, an island, grey floor and white benchtop. 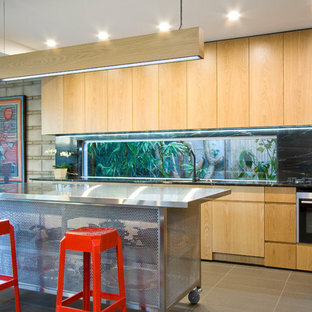 This is an example of a contemporary kitchen in Melbourne with flat-panel cabinets, medium wood cabinets, stainless steel benchtops, white splashback, subway tile splashback and stainless steel appliances. Design ideas for a mid-sized contemporary galley open plan kitchen in Perth with flat-panel cabinets, marble benchtops, white splashback, marble splashback, black appliances, ceramic floors, an island, grey floor, white benchtop, an undermount sink and medium wood cabinets. Contemporary l-shaped kitchen in Brisbane with a double-bowl sink, flat-panel cabinets, medium wood cabinets, white splashback, mosaic tile splashback, stainless steel appliances, light hardwood floors, an island, beige floor and white benchtop. This is an example of a contemporary galley kitchen in Sunshine Coast with flat-panel cabinets, medium wood cabinets, window splashback, stainless steel appliances, an island, grey floor and black benchtop. Kitchen - The Designer by Metricon Botanica on display at Craigburn Farm, SA. This is an example of a contemporary galley eat-in kitchen in Adelaide with an undermount sink, flat-panel cabinets, medium wood cabinets, brown splashback, an island, grey floor and white benchtop. Design ideas for a contemporary galley kitchen in Adelaide with flat-panel cabinets, medium wood cabinets, white splashback, brick splashback, an island and grey floor. Design ideas for a modern u-shaped kitchen in Gold Coast - Tweed with an undermount sink, flat-panel cabinets, medium wood cabinets, window splashback, stainless steel appliances, medium hardwood floors and an island. This is an example of a mid-sized contemporary l-shaped eat-in kitchen in Brisbane with medium wood cabinets, ceramic splashback, light hardwood floors and an island. 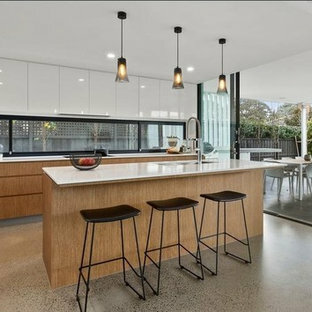 This is an example of a contemporary l-shaped kitchen in Sydney with a double-bowl sink, flat-panel cabinets, medium wood cabinets, mirror splashback, stainless steel appliances, medium hardwood floors, an island, brown floor and white benchtop. Kitchen in Austin 248, from the Alpha Collection by JG King Homes. Truecore steel frame construction with Colorbond steel roof. 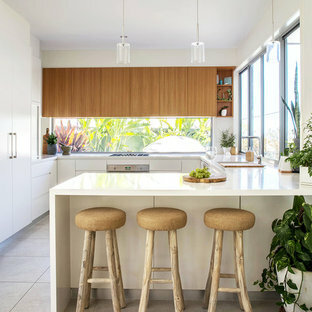 Beach style l-shaped kitchen in Melbourne with an undermount sink, flat-panel cabinets, medium wood cabinets, stainless steel appliances, medium hardwood floors, an island, brown floor and white benchtop. 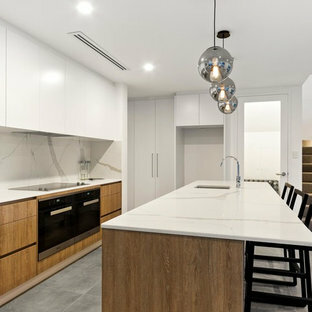 Photo of a contemporary galley separate kitchen in Brisbane with an undermount sink, flat-panel cabinets, medium wood cabinets, grey splashback, black appliances, light hardwood floors, an island, beige floor and grey benchtop. 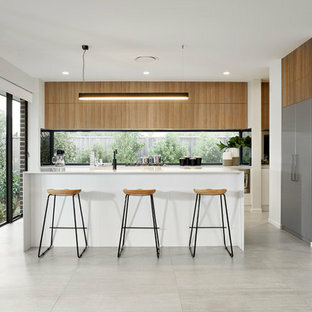 This is an example of a contemporary l-shaped open plan kitchen in Melbourne with flat-panel cabinets, medium wood cabinets, wood benchtops, window splashback, medium hardwood floors, an island and brown floor. 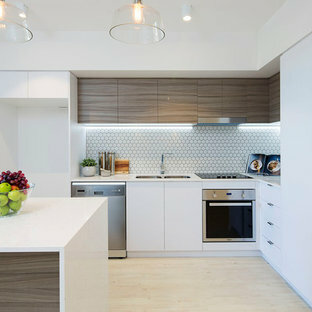 Photo of a contemporary galley open plan kitchen in Sydney with flat-panel cabinets, medium wood cabinets and an island.